Quinoa has amazing health benefits. I have been wishing to experiment with quinoa but when Place of Origin sent me a pack of Quinoa, I was absolutely thrilled. Not only Quinoa, but they also sent me a pack of Oman Dates. With both the ingredients, I was excited to experiment with Quinoa brownies which I was eyeing for a long time now. Chocolate walnut brownie and Nutella brownie are already a big hit at my home. But now it’s time to make family eat something really healthy, so made gluten-free and sugar-free chocolate quinoa brownies. This is again an eggless brownie recipe for those who, just like me, prefer eggless bakes. By now most of you know how much I love eating dates and experimenting with different recipes using dates. Until now I have made many recipes with Fard Dates. But the moment I opened the pack of Oman dates, the quality difference was clearly visible. The crystal clear dates seemed handpicked for me. 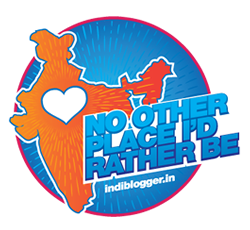 Eat these dates and if you have been eating dates, you will fall in love with them. These large, moist and plump Oman dates had small seeds. This is my first experiment with Quinoa as an ingredient. 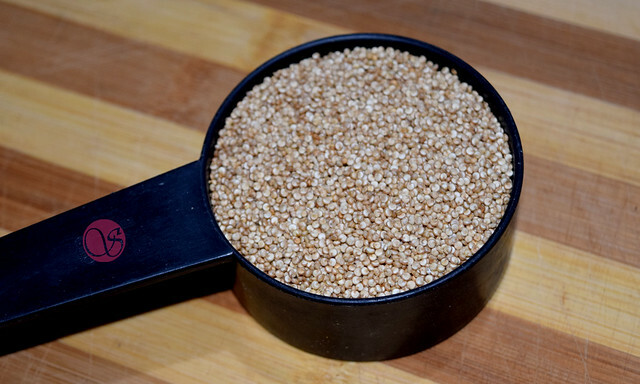 Quinoa is categorized into whole grains, however, it is a seed. 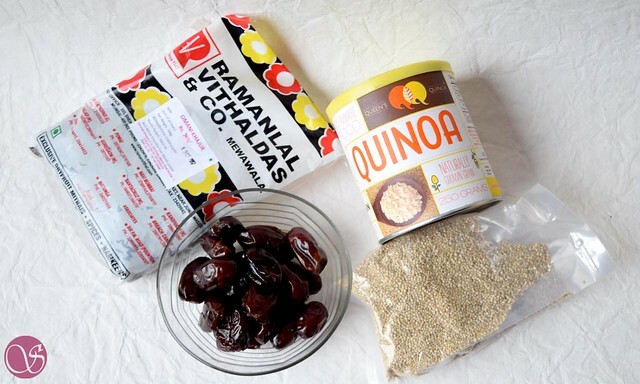 Healthy snacks prepared with Quinoa are naturally gluten free, cholesterol free, and are of high protein. Quinoa can be prepared like rice or barley. I try every possible bit to remove white sugar from my bakes. In fact, I have written a whole article of 20 different sugar substitute and among them my favorite is dates. And this is what I also try to teach during my healthy teacakes and muffins workshop. For this recipe of eggless brownie, I used the dates to make date puree and used it as a substitute for sugar in my quinoa brownie recipe. The date syrup acted as a natural sweetener and made quinoa brownies sugar free. This superfood, a seed considered as grain, is higher in nutrients than most grains. 100 grams of cooked quinoa carries about 120 calories. Cooked quinoa is a combination of 72% water, 21.3% carbohydrates, 4.4% of proteins, and 1.92% of fat. With more than 2000 varieties, dates are cultivated across the globe. Dates are rich in sugar and are high in calories. Certainly good to act as a replacement for sugar in many baking recipes. Dates are a good source of potassium, fiber, and antioxidants. 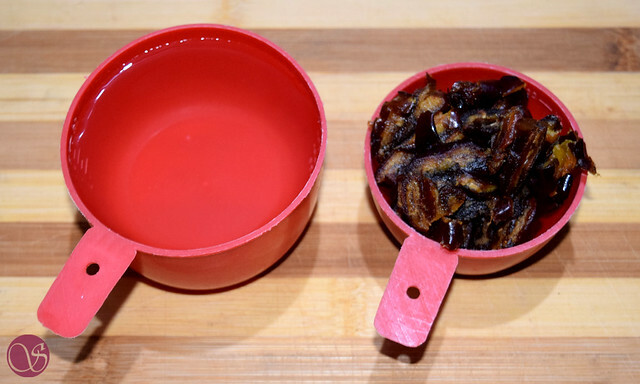 Take pitted dates and finely chop them. 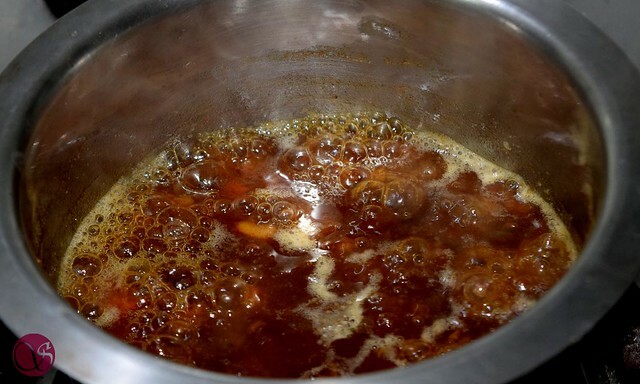 In a saucepan, add dates and water. Bring them to boil and let them cook on medium heat until reduced to half. Then turn off the flame. Let it cool completely. 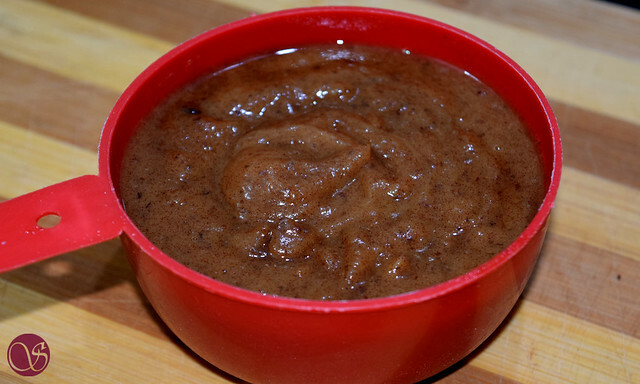 Blend it in a blender and then strain the Puree. You can refrigerate it in any glass jar up to one week and can use as a sugar substitute to bake healthy date brownies, cakes or muffins. 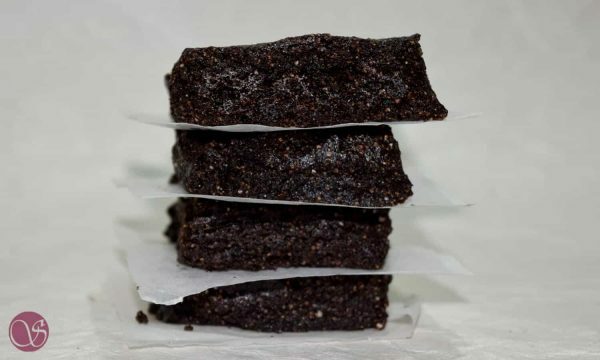 To make quinoa flour brownies, dry roast the quinoa seeds and powdered them. Roasting is important as it helps to remove the earthen flavors from raw seeds. 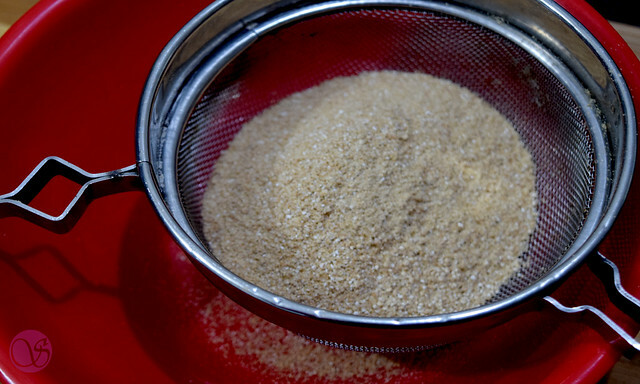 Sift the powdered quinoa to get smooth quinoa flour. This flour is the base of our brownies. There are a number of benefits of quinoa as mentioned above. In a saucepan take dark chocolate and butter. Melt it on low flame. 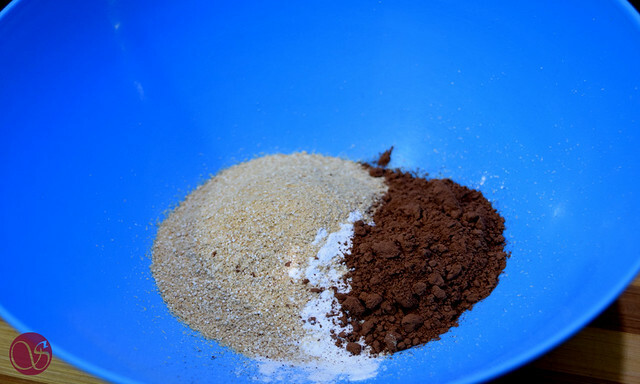 In a large mixing bowl, take quinoa flour, Baking powder, and Cocoa powder. Whisk all the dry ingredients well. Add prepared date syrup and melted Chocolate. Mix all the ingredients well. Meanwhile, keep the oven for preheating at 160 °C for 10 minutes. Line a baking mold with parchment paper and pour the prepared batter of brownies into it. With the help of a spatula, smoothen the top. Bake these brownies in a preheated oven at 160 °C for 20 minutes. For brownies, you can’t rely on a toothpick test. Brownies are best if gooey so you will never get a clean toothpick. I always prefer to bake brownies for 20 min. Once baked take the tin out of the oven. Let it rest for 5 minutes and then de-mold it. Slice the baked brownies and serve with a scoop of ice cream or drizzle some chocolate sauce on it. 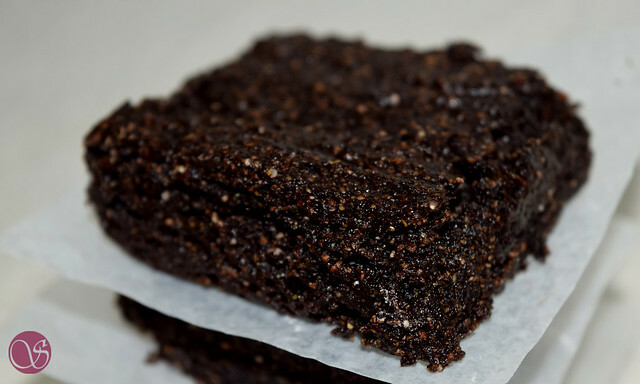 The quinoa brownies are one of the best quinoa flour recipes. Make healthy chocolate quinoa brownies at home with my easy to follow step-by-step recipe. These sugar-free brownies with dates are eggless and gluten-free brownies recipes. 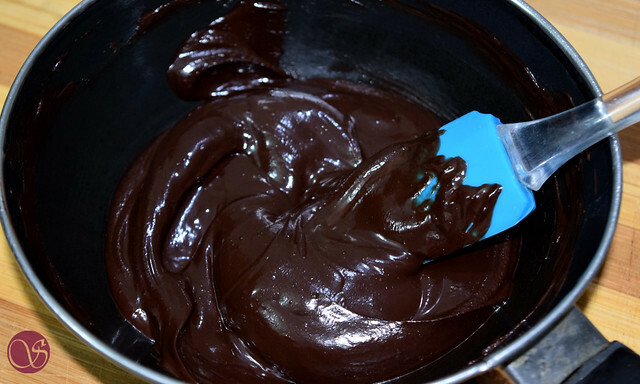 In a sauce pan take dark chocolate and butter. Melt it on low flame. Add prepared date syrup and melted Chocolate. Mix all the ingredients well. Meanwhile keep the oven for preheating at 160 °C for 10 minutes. Line a baking mould with parchment paper and pour the prepared batter of brownies into it. With the help of a spatula, smoothen the top. Bake these brownies in a preheated oven at 160 °C for 20 minutes. Once baked take the tin out from the oven. Let it rest for 5 minutes and then demould it. Slice the baked brownies and serve. Store the prepared date syrup in a glass jar and keep it in refrigerator only. You can use 100 ml of condensed milk in case you don’t have date syrup. You can add your choice of nuts to the batter. Don’t bake the brownies for more than 20 minutes. 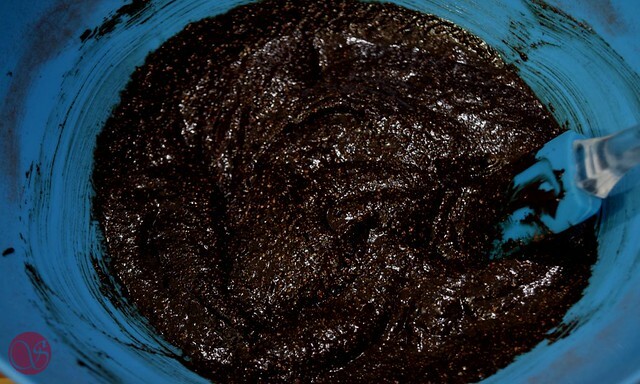 Before de-moulding, let the baked brownies rest for 5 minutes. The consistency of the date syrup should be thick. Don’t skip to roast the Quinoa before grinding. 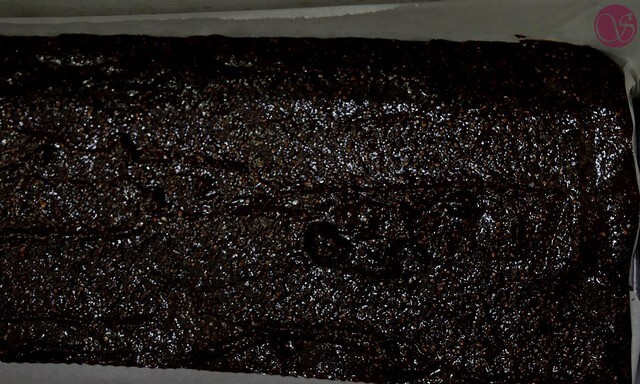 You can bake these brownies in microwave convection at 150 °C for 20 minutes. I have used a pan of 7″x7″. Hi can you please help me as i demoulded d brownies it just cracked … any specific reason for this …. Did you use parchment paper or you just greased the pan and baked? Oh yummy. We have made zucini brownies before but none like these. I am going to try this for sure. Thank you! Thanks for your wonderful comment Maegen. Very interesting recipe!! I have made Quinoa salad sometime back, May be you would want to try that. Thanks Kirti for liking the recipe. I shall certainly try your recipe and let you know the results.